Tobias Wussler of Restaurant Landhaus Bacher in Mautern an der Donau, Austria, has won the Germany and Austria region semi-final of the S.Pellegrino Young Chef 2015 competition – the global talent search launched by S.Pellegrino to find the world’s best young chef. The 26-year-old sous chef was chosen to travel to the grand final in Milan in June, where he will compete with 19 other young chefs from around the globe to be crowned the world’s best young chef. 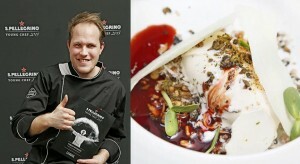 Wussler beat nine other semi-finalists with his signature dish, milk ice made with fir sprigs. A jury panel comprising chefs Karlheinz Hauser, Nils Henkel, Sven Elverfeld and Karl Obauer was suitably impressed with the dish, which was judged on five key elements: ingredients, skill, originality, presentation and message. “His ice cream creation was able to completely win us over with fine flavours, varied textures and an interesting overall concept,” explained jury spokesman and award-winning chef Henkel. “Serving these four top chefs was a real challenge,” admitted Wussler, who drew on his upbringing in Gengenbach, Germany, for ideas. “I was born and raised in a small village in the Black Forest, and the nature around there was a huge inspiration for me,” he said. In his early career, Wussler gained invaluable experience with the likes of Joachim Wissler (Restaurant Vendôme) and Rene Redzepi (Noma). He now works with Thomas Dorfer at the 2-Michelin-star Restaurant Landhaus Bacher, one of the most celebrated in Austria. Wussler now faces the ultimate test at Expo Milano 2015, where he will be mentored by a master chef who will guide him through the intricate process of honing his signature dish. Teaming up with a young fashion designer chosen by Vogue Italia, his efforts will be judged by a panel that reads like a who’s who of contemporary gastronomy: Joan Roca, Massimo Bottura, Gaston Acurio, Yoshihiro Narisawa, Yannik Alleno, Margot Janse, and Eric Ripert.